Behind every great event, there is a team of people who work to make it worth attending. The crew of a concert or stage production. They don't get the applause, but without any one of them, the event wouldn't be complete. One of my friends shared the following video on Facebook. We became friends during our days of working for the San Diego Padres MLB team as members of the Pad Squad (pronounced pawd, not pad)! This video is part of a series called Behind The Lights: The Coolest Jobs Behind The Biggest Sports. The Pad Squad may be known for throwing free stuff into the crowds with cannons and giant slingshots, but they do so much more than that. This video doesn't even capture how fast-paced our days were, but it's cool to get a chance to relive a piece of it! Yes, I got T-shirts to the upper deck! I got to sing the national anthem (live!) both seasons! So fun! Yes, that is Carrie of Miss California/USA fame. I have no comment about "the controversy". We all had a wonderful time together on the squad. 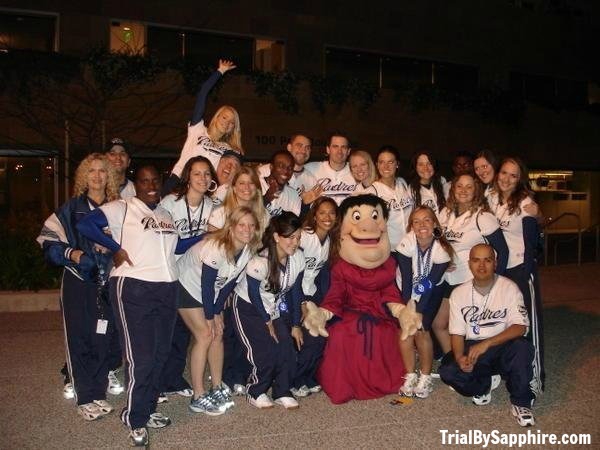 A missed tradition for San Diego Padres fans! We were such a shy group. The next time you're at a baseball game, take the time to acknowledge the many employees around you. A simple smile or "hi". And please, please, please -- be kind to the mascots! Those guys (and sometimes gals) are sweating their behinds off for long periods of time to entertain, boost crowd morale, and have fun with the kids. No one looks macho for beating up on a life-sized cartoon character, and blaming it on intoxication doesn't work either. To all the people working behind the scenes at any event, cheers to you! You have had 7 lives, I swear!! What a great experience! That's awesome!! I am very jealous...I love love love baseball and always wanted to work for the Red Sox...maybe someday! WOW! And you moved to Houston why???? loved the video! i've always wanted to be a part of K Crew here, but keep chickening out when the time comes to try out for it. maybe this will be the year i follow through with it. So awesome!! Even though I'm not really into sports, that looks so fun! And I'm dying over that picture of you in the blonde fro! Such a fun job! I always wanted to do that for the Astros - always thought it would be fun! Number one: love this post!! I know exactly what you mean. As a former stage manager and fast food worker, it's nice to have recognition sometimes! Number two: LINN? I don't even know you. Wow, that looks like a blast. How in the world did you get that job! Amazing. We work promos at the game, so I have to be kind to the employees! Seriously... You have had the coolest jobs ever. It's so true, so many people go unnoticed! Thanks for sharing :) And singing the national anthem... nice! What an awesome job, I've always wanted to be the one to slingshot stuff into the stands. Looks like you had a lot of fun in those couple of years!